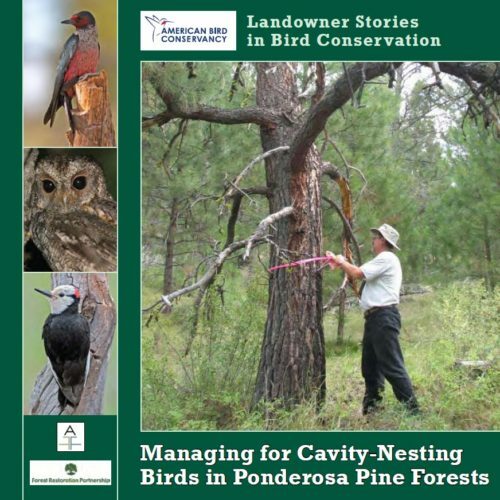 This “landowners’ stories” booklet has been developed as an outreach tool to support ABC’s ponderosa pine cavity-nesting bird program, and to stimulate the interest of private landowners in conducting habitat management for priority cavity-nesting birds and other wildlife. The stories highlight not only some of the management activities and goals of each landowner, but also their more personal relationship with their land. It is our hope that their passion is familiar to many landowners, and that the stories will both encourage those already engaged in bird conservation to continue, and stimulate many others to initiate similar types of activities.